When I was twenty-five, I took an epic driving trip from the top of France to the bottom of Spain; it was a revelatory experience in more ways than one. Having previously only traveled to Paris, I was overwhelmed and overjoyed by all the delights that France had to offer: the slow but incessant variety in the flora, the subtle variations in accent and architecture. It was a neverending list of epic delights for a creature so visual as myself. For reasons unknown, until this trip I hadn’t quite clocked that there was no such thing as capital-F-French cuisine–that what we think of as French cooking is really a greatest hits collection of regional cuisines, gleaned from throughout the whole place. From the poultry-centric delights of the Perigord region (hello, foie gras!) to the citrus and fish of the Cote d’Azur, French cuisine is honestly as varied as everything else in the country–and just as complex, lovely, and unexpected. It made quite the impression on quarter-life me. Thinking about that the other day, I found myself wanting to recreate a dish that I’d eaten not in La Belle France, but in a dive-ish bar in Baltimore, MD. The place itself (whose name unfortunately escapes me–I promise to get back to you on this) was completely unassuming, but the food utterly spectacular. The dish in question was called pork chops Normandy, and it was no joke. 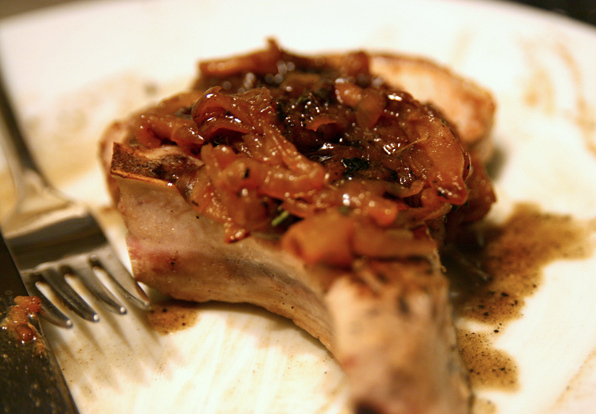 Fat, delicious pork chops perfectly cooked with apples, onions, thyme and brandy, it was sufficiently delicious that I kind of regretted sharing it with Doctor Boyfriend. It was the perfect ambassador for the flavors of the region (Normandy is noted for apples and calvados, among other things), allowing the rich sweetness of the apples and the savory growl of the onions to shine through. Just the memory of it makes me hungry, so it was a no-brainer to try it out in my own kitchen. I cannot stress strongly enough that you do the same. It takes one pan and about 45 minutes to make this happen, from the caramelization of the onions to the braising of the chops; it’s simple and straightforward, but tastes like it took you three days. Never let on that it didn’t. While that’s happening, saute your onions over medium-low heat. When they start to get translucent, aromatic, and just slightly brown, add the apples and thyme. Saute until everything is nice and brown and soft and melty. If you’re feeling sassy, you can help the process along with a slug or two of brandy or apple cider. When they are caramelized enough for your liking, remove the mixture from the pan, cover, and set aside. Remove the chops from the brine and pat dry, season with salt. Up the heat on your pan to about medium-high and sear the chops with a little olive oil until the outside is brown and lovely. The inside will still be raw. Drop the heat to low, add brandy and apple cider. Cover tightly and let it all simmer for 10-12 more minutes, until a thermometer reads 135 at the thickest part of the chop. If you’re feeling really enterprising at this point, remove the pork chops from the pan (set aside and cover) and make a sauce by deglazing the pan with a little more brandy and apple cider. Throw in any scraps of thyme you may still have lying about, and make it unctuous with a pat of butter. 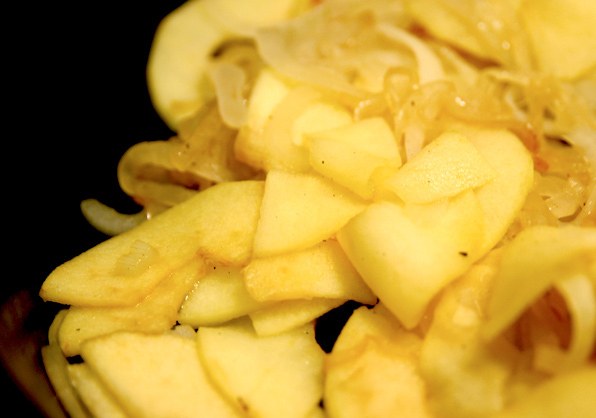 Serve quickly, with the apple-onion mixture and some sauce (and, I suppose, a vegetable of some sort. If you must. ), before the slavering hordes storm your kitchen. It smells that good, I promise. Yum, these chops look amazing! Lots of great flavors, I definitely need to try this. I made these last night and they were phenominal! (I served them with mashed bettery parsnips and a green salad with walnut dressing) Can I ask you about the deglazing step at the end? My pan was still full of liquids after the 10 minute simmer, and I had to boil it down after removing the chops. In the end got impatient and added a teensy bit of cornstarch to make a slightly thickened sauce… was it all suppose to reduce in that ten minutes? I couldn’t figure out how that was supposed to happen in a covered pan. Still, it tasted amazing and I will definately be making it again. Thanks for the inspiration. Gabrielle–I don’t actually have a cover for my cast iron pan, so I jury rigged one out of foil. This leads me to believe that there was a lot more accidental evaporation happening than I’d anticipated…so maybe, if you have a real lid, remove it about halfway through? Also, when I’m reducing pan juices, I tend to turn my stove up to surface-of-the-sun-blazing-hot levels (after removing the meat). So that might also have something to do with it! Maggie and Shiv live in New York and love to cook (even in their tiny kitchens). For more about P&C, click here. Copyright © 2008–2009. All rights reserved.